Are you a stay at home mom and want to earn money to enjoy financial freedom? There are several ways to earn money online just by sitting at home using your personal computer and offline part time jobs if you hate digital devices. Working moms are facing serious issues like health problems, work pressure, lack of sleep, can’t spend time with their family and so on. The best solution to solve all these problems is to become a work at home mom. This article is specially crafted for stay at home moms to start their own home based business to make money. Start your career focusing long term revenue. Plan ahead to maintain punctuality and to prevent getting derailed from the path towards your goal. Planning things before a week or on the previous night will help you to set a specific time for your goal and reach it on time. Maintain a daily checklist. Try to complete all of them ASAP. Beware of quick get rich schemes. Stay away from them if possible. Try to learn and be a leader. Do not copy or follow the same like others. Make your own path, work with passion. Keep these in mind. They’re really important to make your career successful. Starting a blog is undoubtedly the best home based business on internet industry. Anyone with medium to good writing skills can start their own blog to make money online. A blog is a website with informative articles written by a person or maintained by a company. The person who writes a blog is called as the blogger. Bloggers update their blog to feed knowledge to the visitors of which most are profitable and few are non-profit blogs. I’m speaking about the profitable blog that can generate revenue from your content. You must create content and publish them regularly on your blog. Visitors will land your blog to gain knowledge and when they perform certain actions you will make money. The total amount of money a blog can generate depends on a lot of factors and mainly includes the number of visitors to that blog, visitors geographical location, monetization technique used. There are several ways to make money through the blog. CPC monetization is the most used technique to generate revenue from the blog. CPC stands for cost per click which mean when somebody clicks an advertisement placed on the blog, the publisher/blogger will be paid for the click. Adsense by Google is the most profitable CPC network in the world. CPS and CPL marketing are advanced monetization technique. CPS stands for cost per sale and CPL stands for cost per lead. When a visitor performs an action after clicking a link or an ad like purchasing a product/service, register on a website, the blogger will be paid for the visitor’s action. CPC can be otherwise called as PPC – Pay per click and CPS & CPL as PPS & PPL respectively. If you’re a new to blogging, I recommend you to monetize your fresh blog with pay per click advertising program. Later you can consider about sale marketing after building trust among visitors. The first and basic requirement to start a blog is the niche. You have now planned to start an information based blog to feed knowledge to your visitors. The first question is what will be the blog about? You should first choose a specific niche that you’re interested in writing. Ladies are mostly interested in fashion, food recipe, Arts & crafts, women health, family etc. You can go with them or choose a different niche. The other factor to be taken into consideration while starting a blog is advertisers demand. Try to choose a niche that has more advertisers. Only if there are more advertisers, there will be more competition in advertising on blogs urging them to pay more to the publishers. From the niche mentioned above, there are tons of advertisers available for women health and there are very few to advertise their food recipe. The women health blog can generate the same revenue with just 10% of visitors that lands food recipe website. This means the pay per click is 100 times greater on health blog compared to recipe blog. This is just an example written for you to understand about how to start a profitable blog that can generate good revenue. You can read my guide to choosing a profitable niche. After choosing a niche it’s better to research more about it. You should not start a blog right away. Just Google and find the blogs related to the niche you’ve chosen. Go through those blogs to get a rough idea. Take some notes in a physical book that will be helpful to refer later. Now you’re all set to start a blog. Starting a website is now really easier than before. With technology at its peak, no coding knowledge is required to start a blog. Everything is ready made now and it will take less than 15 minutes to setup a blog. After setting up you can start to write the article(s) from day one. Read this article to learn how to setup a blog in just 10 minutes. After setting up the blog, write an article on the same day and do not postpone to the next day. This will really increase your confidence and engagement. Plan things on the previous night to prevent waste of time on the next working day. Do not hurry, initially publish at a speed of one article per day. Take your time to write the article, make it long, informative and engaging. The article should contain at least 1000 words if possible. The article should not be written in a single paragraph. Split it into few paragraphs with subtitles and images. After completing the article do not publish it immediately, get away from your computer for 15 minutes or more. Come back again read the article to check the errors and grammatical mistakes. Once you confirm the article is error free, publish. After a month analyze if you’re ready to monetize your blog. Don’t hesitate to improve your website until you feel it is the right time for your blog to generate money. When your blog has a complete structure, that’s the right time to harvest money. Make use of the beginners guide to monetize a blog. Visitors are the blood of a website. You can earn money only if you receive traffic to your website. A blog that gets more traffic can generate more money and speaking about the traffic it should be a quality one from search engines like Google, Social medias like Facebook and not from spam sources. Use this guide to learn how to generate quality traffic to your blog. How much can a blog generate? There is no answer for this question. There are several factors to be considered of which quality rules. Quality traffic, quality content, quality visitors, quality niche and the monetization method are key that determines a blog’s fate. A quality blog with 1000 visits will generate more money compared to regular blog with 10000 visits. So, maintain a quality blog to earn more. Hope now you know the best way to earn money online as a stay at home mom just by spending few hours per day. Initially, you should spend 8+ hours every day to research, write content and when your blog becomes a big brand, working one or two days per week is more than enough. The only long term passive revenue generating machine is the blog. But, you might have understood that starting a blog, ranking it and making money is not easy as we say. The hard way is always the better and if you have no patience or not interested in writing, there are lots more methods for stay at home moms to make money which are listed below. These are the instant money making programs which require active participation. Paid surveys are the research programs conducted by survey panels to explore. A survey that pays for participation is called paid survey. Studies are conducted for various reasons where most of the studies are about products of the companies. Recently I’ve participated in a survey about Google chrome the product of Google, the internet giant. It was a 15 minutes survey where questions about Google chrome like its speed, security, reliability and its features like multiple device signs in feature, offline youtube feature etc. were asked in the section and in the next section, I was asked to compare it with Firefox, edge browser, Safari, Opera etc. Google conducted this survey to ask the views about Google chrome from daily users like us. The data will be gathered to create results which will be used to improve Google chrome even more. This survey was conducted by a survey panel that paid me $1.52 for completing it. Amazing, I earned $1.52 in just 15 minutes and that is incredible $6.08/hour. Paid survey is a reliable Money program for stay at home working moms. This is as simple as choosing the best relevant answers. For participating in the survey, panels pay up to $10 / regular survey, up to $200 for premium surveys and up to $1000 for engaging in long-term research such as clinical trials. Spending 2 – 3 hours per day you can make $10 to $35 very easily without any work pressure that you might feel while blogging. Apart from products surveys are conducted on Fashion, Information technology, Smartphones, Leisure, in-home usage etc. So, why don’t you start to earn money by participating in paid surveys? Here is the guide for you to about paid survey. Freelance work is one of the best ways to earn money. Getting hired by a professional client for a project is the dream for work from home moms. Freelancer moms will be asked to complete a project under the certain time limit. They can set their own timing to complete the task within the given time frame. For example: If the project completion deadline is 15 days since this is freelance work the freelancer can work anytime as per her convenience provided the task is completed within the deadline. To get hired by a client, the freelancer mom should have certain skills in a department. Uneducated, illiterate moms are not eligible to be an online freelance worker in most cases. A freelance worker has chances to earn 100 times more than a blogger if she is really talented. Read how to become a successful freelancer. For those who think they are not fit to get hired by a client or an illiterate looking out for a local offline job, part time jobs are the best alternative. Tons of part-time jobs are available for ladies of all categories from an uneducated one to the doctorate. Part time jobs are available on various timing, shifts from hourly to full day. Part-time workers can apply for any job based on their convenience provided their profile comply with their terms. You can search for part time jobs here at free of cost. Read this – Why you should not try Captcha entry jobs? Online teaching has become easier than ever. Stay at home moms and retired teaching professionals can make use of this online tutor programs to earn money. There are several sections in online tutoring like teaching languages, guiding a graduate, teaching individual subjects schools students, helping for Ph.D. research. Online tutors are earning up to $500 per hour based on their qualification. Apply today to get hired as an online tutor. Customer care testing otherwise called as mystery shopping is an interesting way to earn money. Moms who feel bored about working on the computer can use their speaking skill to test the workers through the phone call. Mystery shoppers are hired by the companies to test their own customer care services. The recorded conversation will be used to analyze individual customer care, technical support and improve their business. The mystery shopper will know what they’re doing and the purpose is to test the customer care support. But, the support member will not be aware that the caller is a mystery shopper. Mystery shopping is a really funniest way to make money and the best for stay at home moms who can earn up to $30 / hour. Mystery shoppers are paid $5 / test call that will be for about 5 to 10 minutes and in the case of online mystery shopping which requires no voice calling the mystery shopper will receive $2 per action. Apply here to become a mystery shopper. Photography is a passion for most of the people. They love playing with their camera forgetting themselves. If you’re a mom with visual communication degree or really know how to capture attractive pictures, you are going to make some serious money. This is not easy as we think. Now a day technology has grown so much even a kid can capture a great shot without blur effects, thanks to the technology. The photographs should be unique with the best quality. A small shaky effect can reject your photo, so you should capture a shot more than once to pick up the best. A click using the index finger is not photography, it is an art that has to be mastered. If you’re going to choose this profession, get a high-resolution camera with detachable lens. What kind of photos can be sold? Any photos can be sold like nature, adventure, sport etc. Images with working action have more demand, like a lady or student working on a computer. If you think your face is might fit such professional activities, you can be your own model. One perfect photo can earn you for the lifetime. Other than camera captured photos, you can also sell animated photos or design a custom animated images, infographics for clients. There are two ways to sell photos. One is by selling the photo for one time cost to a client and the other way is earnings royalty fees each time when a person downloads your picture. Start selling your photos here – iStock, Shutterstock. With currently blogs & websites ruling the internet, the future expectation to see huge growth in Video marketing [Youtube] and Social media marketing. Adapting ourselves to the future at present is brilliance. Start a YouTube channel to make money from videos. Similar to blog traffic, YouTube videos get views and the video marketers earn money by monetizing their videos using YouTube Partner program or through direct sponsors. As a stay at home mom, you can start a YouTube channel to make money from your videos. Here are the few topics that are trending – Beauty, Fashion, current affairs, health, funny videos compilation, gaming channel, travel, train videos, accident videos, etc. Make use of this guide to learn how to start a YouTube channel to make money. 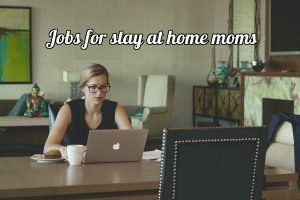 These are the best-proven ways for stay at home moms to earn money. Hope at least one program suits your interest. I highly recommend you to start a blog if you wish to earn reliable passive income online just by spending few hours per week. Being an owner of a blog or YouTube channel, you have a chance to create your own fan base. If you have more ideas or need any help leave a comment below.